In this workshop, you will learn how to use the NSKeyedArchiver and NSKeyedUnarchiver class to save and restore your application’s data in a binary file. You will also learn how to create a binary file in the application’s sandbox. iOS provides several mechanism for saving and restoring your application’s data in its sandbox. One method available is to use the NSKeyedArchiver and NSKeyedUnarchiver class. These classes do not provide the scalability of a database, but they are easy to use. Also, they can archive/unarchive all kinds of objects, not just strings, arrays, and dictionaries. This class provides the ability to encode data into binary data that is written to a binary file. The binary file must already exist in the application sandbox. The process of converting an object into binary data is called encoding. By the way, the NSKeyedArchiver class encodes the entire content of the object (an NSArray for example) before writing it to the binary file. This class decode a binary file’s data. Once the binary data have been decoded, you can place it your view’s controls; for example, a textView control or a pickerView control. The process of transforming binary data into a usable object is called decoding. By the way, the NSKeyedUnarchiver class decode the entire content of the binary file. This mean you’d have to use a for or while loop and an if statement to access a specific object and its properties. 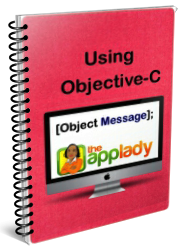 Now you know the purpose of the NSKeyedArchiver and NSKeyedUnarchiver class, I will show you how to use them in an Xcode project I’ve already created for this workshop; so, click the link below to download it. 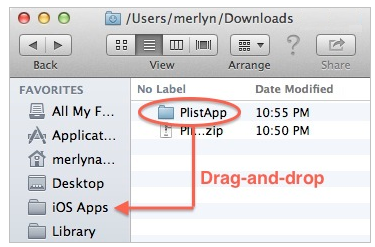 After unzipping the file, use Finder to drag-and-drop the PlistApp folder in the iOS Apps folder you’ve created on your Mac. 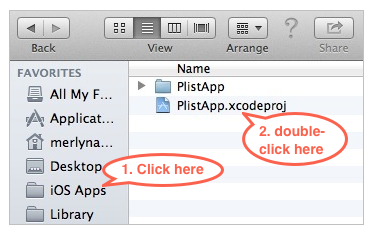 Use Finder to locate the file, PlistApp.xcodeproj then double-click it to launch it in Xcode. I’ve added code in the viewController.h file and the viewController.m file. I’ve connected the view’s controls in Interface Builder for you too. So go ahead, run the application, and try out the view’s control, except the pickerView control. The app will crash if you try to use it. Notice how the keyboard is dismissed when you click the view’s background or the return key. That’s because I’ve added code in the viewController.m file to handle these events. When you are ready, terminate the app by simply returning to Xcode, then press the (command + .) keys on your keyboard; or click the toolbar’s Stop button. What Will The App Do? You’ll have to add code in the ViewController class and the AppDelegate class to implement above user requirements. Before the user can add books in the binary file, you’ll have to add code in the AppDelegate (.h and .m) files to create a binary file called BooksOwned.archive in the Documents directory. As you already know, that directory is located in the Plist App’s sandbox. Here’s a snap shot of what the sandbox currently look like on my computer. As you can see, the Documents directory is empty. 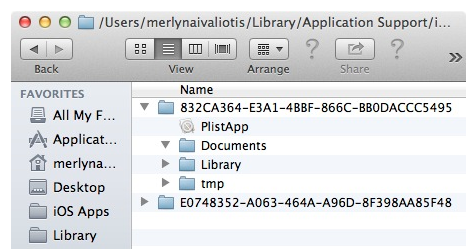 Now is a good time to use Finder to access the Plist App sandbox. Take a look at the file path shown in above image. It shows the path to the PlistApp sandbox. Once you’re there, expand the Documents folder, so you can see the binary file created there later on. 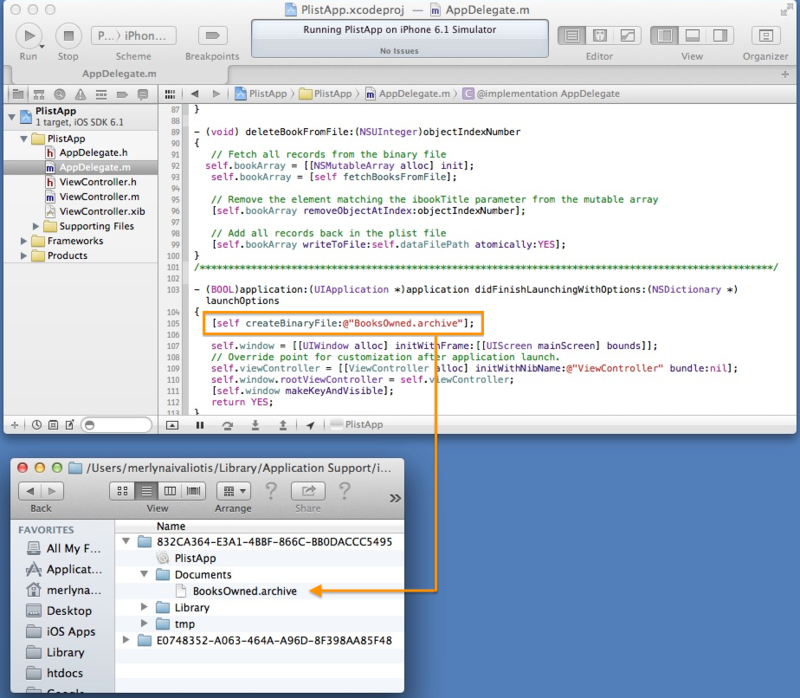 Now, I want you to click the AppDelegate.h file add highlighted code. Next, click the AppDelegate.m file and add highlighted code. The next thing I want you to do, is add this statement in the AppDelegate.m file’s didFinishLaunchingWithOptions method. 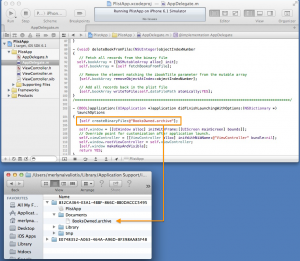 In a nutshell, you set up two custom methods in the AppDelegate class. The first one, getPathToDocumentsDir, gets the full path to the sandbox’s Documents directory and return it to the caller of the method. The second method, createBinaryFile, creates a binary file in the sandbox’s Documents directory, only if it haven’t been created there yet. The name of the file the method creates is passed as a parameter. Ok, run the application in Xcode by clicking the Run button on the toolbar button. As Xcode build and run the app in the iPhone Simulator, you should keep your eyes on the Plist App sandbox’s Documents directory, which you should have already expanded in Finder. In seconds, the BooksOwned.archive file is created right before your eye. AppDelegate (self), create a binary file called, BooksOwned.archive in the PlistApp sandbox’s Documents directory. Ok, the BooksOwned.archive file is created in the sandbox’s Documents directory. We can now turn our attention to adding code in the SaveButtonTapped method. It is connected to the Save button control. When the user tap it, code the SaveButtonTapped is fired. 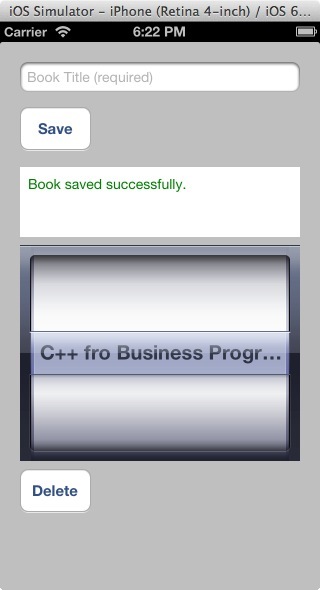 This mean we need to add code in the method to basically save the book title the user enters in the textField control, in the BooksOwned.archive file. In order to figure out what code to add in the saveButtonTapped method, I used this pseudocode to express the method’s algorithm. Pseudocode is basically false code, used by programmers to express the application’s algorithm. An algorithm is like a recipe: it list the steps involved in accomplishing a task. 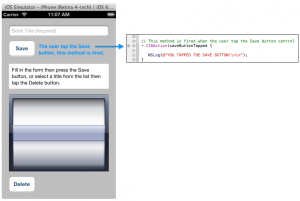 Expressing the saveButtonTapped method’s algorithm in pseudocode, makes it easy to transform the pseudocode into Objective-C code. There is no standard form of pseudocode-you make up your own rules. The only-guideline is that the meaning of the pseudocode should be clear to anyone reading it. Add the bookTitle in the binary file. Armed with above pseudocode, let us add code in the viewController.m file. First, click the file to load it in the code editor, then add this import statement below existing one. This import statement import the AppDelegate class, so we can use its properties and methods in the viewController class. 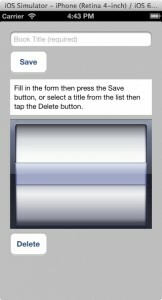 Next, scroll down to the saveButtonTapped method and add this code. Notice how I used steps of above pseudocode to document the button’s code. I want you to add this code in the AppDelegate.h file, which declare methods used on in above code (line 14 and 17 ). While you are there, declare the third method you see below as well. Next, add this code in the AppDelegate.m file, which implement above methods. When you are done, run the application. Test the SaveButtonTapped method’s if() block statement by entering a book title in the textfield control, then click the Save button. You should see output shown in Figure (a) below. Next, test the else block’s code by clicking the Save button without entering text in the textField control. You should see output shown in Figure (b) below. Here are the pickerView control’s dataSource methods to add in the ViewController.m file, which display data in the pickerView control’s component rows. Here is the delegate method of the pickerView control to add in the viewController.m file. Before testing the pickerView control’s code, you’ll have to add these statements in the viewController.h file’s viewDidLoad method. You entered code in a delegate method of the pickerView control, which highlight the pickerView component row the user selects and display it in the messageLabel, located below the Save button control. I want you to use the viewController’s textField and Save button to add these books in the BooksOwned.archive file. 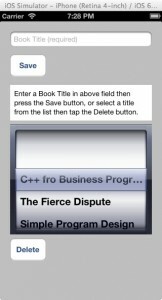 Notice how the book title appears in the pickerView control and is highlighted, when you click the Save button. Once you’ve entered the last title, terminate the application. When you relaunch it, the book titles you added in the BooksOwned.archive file shows up in the pickerView control-see image above. The last piece of code you need to add in the viewController.m file will go in the deleteButtonTapped method. It is connected to the Delete button control. 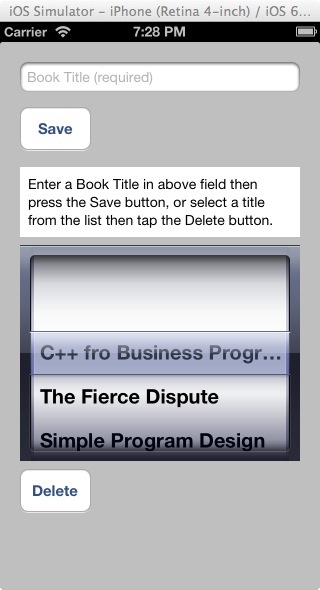 Once you’ve entered above code in the Delete button’s method, run the application and delete one or all book titles from the pickerView control, then terminate the app. When you relaunch the app again, rows you deleted from the pickerView control don’t show up. That’s because you’ve added code in the deleteButtonTapped method to delete a book title from the pickerView’s dataSource object (pickerViewDataSource) and the binary file (BooksOwned.archive). This concludes this week’s workshop on how to use the NSKeyedArchiver Class and the NSKeyedUnarchiver class.